Yesterday I had my appointment with my psych doctor and it went well. I explained to him that in hindsight I felt going off of the Wellbutrin and not trying another anti-depressant was a mistake, that I felt I had been going downhill over the last six months, culminating in a couple of weeks of crying and some very negative thoughts. I also told him in less than a year I’ve gained 90 pounds, because to put it simply, I eat my feelings and I’ve not been well. Of course it took months for me to see it for myself because I never see it until I’m about thirty feet underground. He pointed out that I’ve been having manic depressive cycles which I should not be, and we decided to try Zoloft and see where that leaves me. Later we may try increasing my dose of Geodon as well if this doesn’t control my cycling. I took the first dose of the Zoloft last night. After I picked up my new Rx, I stopped by Michael’s and found two skeins of yarn I liked in the clearance aisle, plus got some others that were on sale, plus I had a 20% off coupon. I also got two rubber stamps for $1.00 each. 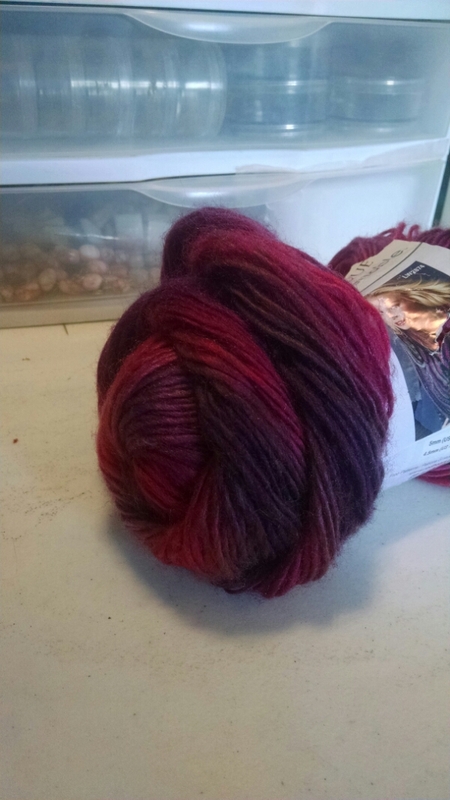 One of my clearance yarns. I've been wanting to try this yarn for a while but it's rather expensive for am acrylic yarn so hadn't gotten any until now. We had pool league last night and I did terrible. 16 points across all 4 games, my best game being a 6. Just not a good night for me or really anyone on our team. We only won one set. After we left pool, we stopped by Berry Star and got frozen yogurt. I tracked all my food yesterday and managed to stay under my limits. I’m trying to use up all the meat in the freezer before I buy more, and I think we have about 5 days left – I think we will run out right before the end of the month. After we got home, Mattie went right to bed, and I fed the dogs, did the dishes, took the dogs out to potty, put some purchased craft supplies away, put the dishes away, checked the mail, sorted out and threw away Mattie’s holey socks, and put the laundry away. It was a lot of stuff but it only took about 45 minutes to do. Then I finally got to bed.